In October 2006, we went on our honeymoon in Kenya. We booked with Sun World Safaris and I?m happy we did that! It?s a great company and we?ll use them more often. Our airplane arrived very late in Nairobi, so the first night we stayed in the Nairobi Safari Club. A nice hotel with friendly staff and good food. The next morning we went to the Serena Mountain Lodge, near Mount Kenya. It's a fine lodge. Wild animals are attracted by the big waterhole in front of the lodge, and there's a terrace, so you can simply sit there with a drink and watch the animals coming. Among others there was a huge wood-pig - a great sight. Afterwards, we went for a game drive and to be honest, this was more exciting than sitting at the waterhole. At some point we came across a huge herd of elephants. It was amazing to see. One baby elephant had a bad leg, he could hardly walk. It was moving to see the herd waiting for the little elephant each time. We asked the park guards to do something about his leg but they said the elephants were too dangers. Really sad. At night, at the lodge, we saw a genet and some hyenas chasing a bushbuck. They were attracted by the meat put outside by the staff. Next morning we were off to Shaba National Reserve, where we stayed in Savora Lodge. We can recommend this too: very good rooms, good food and a helpful staff. The scenery in the park is magnificent but we didn?t see a lot of animals. Some zebras, oryx and some elephants only. Later we saw a lot of monkeys playing with each other. Very funny! A couple of days later we went to Samburu National Reserve. We were able to see a lot of wild animals there - lions, leopards, giraffes, cheetahs, buffaloes, impalas, zebras and a lot more? We even saw a leopard lying in a tree. He was very relaxed and just kept lying there, even though there were dozens of cars around him. It really took a long time. Normally, leopards are pretty hard to spot. In Samburu, we stayed in an excellent tented camp (Larsens). The camp is next to the big river across the reserve and we had a great view from our tent. In the night we could hear the lions roar. The staff was very friendly and helpful. After that, time to head on to Sweetwaters camp. Our tent had an excellent view on the waterhole. 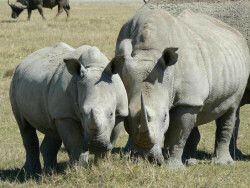 During the game drives, we spotted antilopes, elands and even a lot of black and white rhinos. But no lions, leopards or cheetahs, unfortunately. During one of the afternoons, we went to the rhino park there. I had an amazing experience there. A rhino came to us and before I knew it, the park guard gave me some brunches from a bush and the rhino was eating them from my hands! From there, we drove to Lake Nakuru National Park. We stayed at the lodge there. I have to say the food wasn?t very good here, but the rooms were good. It?s a busy place, lots of tourists. The park was magnificent. During the game drives we spotted rhinos, lions, buffaloes, impalas, giraffes, zebras and of course a lot of pink flamingoes, where the park is famous for. And the best was we say 4 leopards! On one occasion he was hunting an impala, but it got away. On a second occasion we caught a leopard who had just killed an impala at the road. It must have been minutes earlier. We also had lunch at the baboon cliff. You have an excellent view over the park from here. The next days were spent in Naivasha Country Club. We didn't have a great time there - the staff wasn't very friendly. Our stay in Elsamere, the next day, was better. It's the former house of George and Joy Adamson and we're big fans of them. It was great to be there for us. The garden was very relaxed and the scenery around the house just magnificent. At the beginning of the evening, close to sunset, I was reading a book and suddenly there was a buffalo in the garden. It was great to see! In the meantime, we did a lot of driving. But the roads in Kenya are terrible. We couldn't help wonder what Kenya does with all the foreign aid they get each year. Our last night we stayed in Giraffe Manor, and old estate in Nairobi that used to belong to an old British family. It?s one the nicest places we?ve ever stayed. Around the house, there are many Rothschild Giraffes. There aren?t many of them left, and the people from Giraffe Manor have a project helping them grow up and returning them into the wild. One morning when we were still in bed, they were sticking their necks through the open window! Our last appointment was the Sheldrick elephant orphanage in Nairobi. Young elephants without parents are brought here. When they are grown up, they are brought back to Tsavo East and West. It was very special to see those young elephants. After that, we flew back to Germany again, full of great memories. We?d like to thank Sunworld Safaris again for their job well done! We hope to return soon to Kenya. Hi Karin and Stefan, thanks for posting this very good travel story! It's giving a good idea of all the great things you can do in Kenya. You obviously saw a lot and stayed in some very fine places. And you also visited some parks off the beaten track. Great for you! Join in and write your own page! It's easy to do. How? Simply click here to return to Kenya Honemoons.